Three speakers with experience with various divestment efforts will talk about how to go about divesting your congregation or denomination: the Rev. 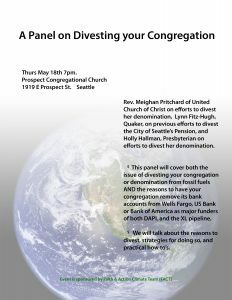 Meighan Pritchard of United Church of Christ on efforts to divest her denomination; Lynn Fitz-Hugh, Quaker, on previous efforts to divest the City of Seattle’s Pension; and Holly Hallman, Presbyterian on efforts to divest her denomination. This panel will cover both the issue of divesting your congregation or denomination from fossil fuels and the reasons to have your congregation remove its bank accounts from Wells Fargo, US Bank or Bank of America as major funders of both DAPL and the XL pipeline. They will also talk about the reasons to divest, strategies for doing so, and practical how to’s. Event sponsored by Faith & Action Climate Team (FACT).